This entry was posted in Uncategorized and tagged A Cry For Justice, Church Abuse, CJ Maheney, Hebrews 12, Job, John 11, John Piper, Oklahoma, Rachel Held Evans, Reformed Theology, Romans 8, Tragedy. Bookmark the permalink. We’re in your camp, friend. You are definitely not alone. Brilliantly written. Re-posting immediately. Excellent post. It may be a curse of the Reformed to try to process things with answers rather than compassion- but it is very damaging. Thanks for sharing, Jeff! I look forward to reading it! Truth AND love. And there’s a time for both. And the time to quote the pain of Job and “explain” the actions of God is NOT while firemen are still pulling children and teachers’ bodies from the rubble of a natural disaster. WOW yes! I too am “Growing beyond” the greats that brought me to Reformed theology. I think it is good to have your theological ducks in a row but if you loose your love for people and your compassion for the hurting then all you have is the empty, vain knowledge of the Pharisees not the rich, life changing, passionate love of Christ. Chris and I have often wondered if we were alone in our desire to be grace-filled and kind yet firm in our theology. You’re welcome to pitch your tent next to ours…it’s in the camp that prefers to rest in the mystery that lies between God’s Sovereignty and human responsibility rather than claiming to have it all figured out. We have personally witnessed how damaging the dogged dogmatism and arrogant “freedom” of many in the Reformed camp has been to the Bride of Christ. I’m not sure I’d throw every Reformed theologian under the bus, but I do find that often their swift answers about God’s Sovereignty in the face of tragedy leaves me cold and longing for them to display more compassion and grace at least initially. What happened to “mourn with those who mourn”? (Romans 12:15) And maybe, just maybe, we should share the hope of the gospel with them in addition to reminding them of God’s judgement! But those that are pitching our tents should also be careful to do so in love and humility…being careful not to throw respected theologians, whom God has used and continues to use mightily, out with the bath water! Yes to all of this! That was my biggest fear in posting this– that I would seem as cold and judgmental as the ones I was confronting. But there must be some way to embrace the tension and mystery of Sovereignty, the effects of the Fall, and the consequences of man’s free will– without having to explain it away or pack it in a neat little box. I’m for sure not throwing every Reformed theologian under the bus; not even throwing all the work of Piper and Maheney away. I’m just hoping to start a dialogue that loudly proclaims that you can be Reformed in your theology and still be full of grace and compassion, embracing the mystery of Christ and the messiness of this world simultaneously, without feeling the need to explain it all. Thank you for your love, wise words, and support! I agree completely with all that has been said so far: in the post and in the comments. Yes, weep with those who weep, and sit with them wordlessly if they give you permission to do so. That is often the best way to comfort those who are traumatized or grief stricken. After sitting and feeling for some time, you may, just may, feel moved to ask some gentle question, or offer some tentative words. I totally agree that John Piper has displayed lack of compassion. And I think his second tweet is not an improvement on his first, in fact, it just shows that he still doesn’t get it. Why not just say “I got it wrong in my first tweet; please forgive me.” And leave it at that. Excellent post, and thank you for writing it. I really like how you encouraged us to use Job to “respond to tragedy, not evaluate it.” Wonderful insight, and thanks again. He did retract his first tweet and I think his second tweet is pretty much closer to what we should say. Men are fallible – not even John Piper is God. But, I would also use one of your last statements to prove the other side of the coin – Who can know the mind of God? Sin is sin. I don’t there there were tornadoes before the fall. So this whole world – even creation – is longing to be redeemed by its Creator. And listening to the news special last night – it is just stuff that the majority of people lost. I pray the ones who lost stuff and people would turn to a God who is compassionate and merciful. He had mercy on the rest of us by just not wiping us all away. In your justice, remember mercy. Great post. I’m going to add it to my post on the same subject that went crazy yesterday (noticed that someone tweeted my post and tagged Rachel Held Evens and she retweeted – that probably helped – move things along – lol). The Desiring God website has offered an explanation to the deleted tweets. I have a problem with this. Why didn’t John Piper tweet a link to this explanation? I find that odd. If the “confusion” happened on Twitter, then it should be posted on Twitter. A commenter also mentioned that there was more than one tweet – so the context might have changed when reading both verses together. When I took the screen original shot, I do not recall the other verse that was mentioned. I’m not saying it wasn’t there, but I do not recall seeing it. I don’t read anything inflammatory in Piper’s original post. He was simply stating exactly what happened in Job’s tradgedy. Job was confronted suddenly with the deaths of his children by a tornado(whirlwind). He, too, knew the horror and devastation that comes from natural disasters. I found nothing in that tweet that says Piper was thinking or even intimating that this was an act of wrath or judgment on God’s part. In fact, I would think that John Piper would know that the book of Job is not about the wrath or judgment of God on a person’s life, but the realization that we are not God and sometimes He allows things for purposes that He doesn’t let us in on. I think you’ve been judgmental in assuming that was what he meant. Maybe simply stating what happened to Job isn’t what hurting people needed to hear at that time? Jeff, that is exactly the question I was hoping a civil discussion would bring about. My point is not judging intention; like I said in my post, I love and respect Dr. Piper. His work has shaped me spiritually for many years, and I appreciate his words and dedication to the ministry a vast majority of the time. However, as tragedies become more frequent (really, technology just makes us more aware of what has always been going on in the world) it raises the question “How do we BEST respond to tragedy?” Is it with short yet profound truth like Job 1:19-20? Or should we as believers begin to ask a bigger question: should venues like Twitter even be used in addressing such complex issues as grief and death? Should we toss out verses that can appear trite and judgmental, or do we take the time to craft a grace-filled letter/post and Tweet the link? Can you address tragedy in 140 characters? I think you can address these things on Twitter: “My thoughts and prayers are with this afflicted by the tornado”. I think the real issue here, and it’s made clearer by the response on the DG website, is that Piper just really doesn’t understand how his words affect people who suffer. This is a huge issue, and this is not the only instance of it happening. When people are suffering, they don’t need ideas. They don’t need answers (not yet, anyway). They don’t need to be told what a proper, Godly response is. Thy need you to empathize, give a hug, hold a hand, and be present, if not bodily, in spirit. They need to know you are standing with them. This is what Piper failed to do. He addressed a human need with ideas, not his presence. And I completely get that for him, he felt like what he said truly WAS encouraging, but that in itself is quite disturbing (though I AM glad he had the awareness to see that it wasn’t and remove it). But it’s disturbing because as a pastor, people look to him for hope and healing, and he shows a lack of understanding how to give it. Instead, he focuses on ideas to help people think better. That is a good quality, but if it is not combined with empathy for the hurting, it becomes noisy and painful to listen to. In scripture, God did not comfort Job with knowledge, but Job did get God’s presence. In the Incarnation we got some knowledge, but more importantly we got Jesus’s presence. And the foundational event of the church was not an idea, but the presence of the Holy Spirit. Sorry, commenting from my phone. I believe Piper loves Jesus and wants to serve him, and that he has some wonderful doctrinal insights, but he needs to start understanding the suffering before he tries to speak into their lives. Most of the time, theology isn’t a comfort to a hurting soul. You know, after a day of turning this whole thing over and over in my mind, I am left feeling completely disheartened. Not only because John Piper would find it appropriate by any stretch of the imagination to tweet to these people (http://news.nationalpost.com/2013/05/22/hand-in-hand-how-best-friends-died-as-their-school-disintegrated-in-oklahoma-tornado/) in the midst of their suffering the way he did, but also because the large majority of the church for some reason can’t see what’s wrong with what he tweeted. “Hey, it can be supported by the bible” seems to be the only standard by which we judge anymore. Where is the compassion? Where is the empathy? Where is the love? He tweeted the Word of God. He loves people and has compassion. He has enough compassion to speak truth. I find hope in what he tweeted. You find encouragement in what he tweeted. Were you someone who lost something important in the Tornado? Even if you are, what does your statement say to all of those who found pain in what he said? Are you telling them that they are wrong to feel the way they do? Do you think it is compassionate when someone is at their lowest point to tell them they are not responding emotionally in the proper way? I agree with Desley – that so many Christians cannot see why this was wrong is chilling. Incidentally, Piper himself acknowledges that the tweets themselves were the wrong thing to do, which is why he took them down (he says he realized they were not encouraging in the way he intended); the problem his he apparently doesn’t understand WHY and didn’t see it before making the tweets. Just because something is true does not automatically make it the compassionate thing to say. If Christians cannot see this, we cannot be salt and light because we do not know how to love. And that is a serious problem, because without love the scripture says we have nothing. 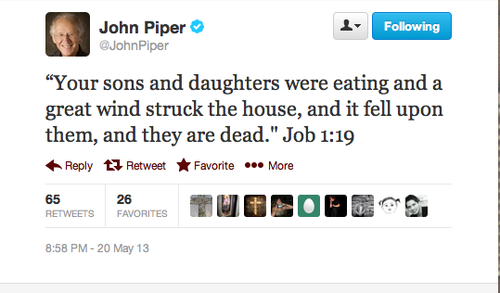 How was John Piper “explaining” what happened? I still fail to see your point. Friend . . . . This post (and many others like it) are basing their findings off of John Piper’s past remarks of other events and tragedies. He has a reputation for poor timing in the midst of deep pain, sorrow and suffering. I don’t know why, but he does. We are not judging his motives here. We are basing these thoughts off of many examples of JP’s insensitivity in the face of deep grief. I have listened to John Piper 1000 times. I love his preaching. This time, he was wrong, like we all sometimes are. He is human, like we all are. It is not a terrible thing to be human and to make mistakes. We are not “against him”. We are hurting . . . and shocked . . . and we all wish that a man in his position would have shown some compassion . . . just not cold theology. Thanks for listening. Libby, for my part I didn’t see Piper as evaluating this tragedy as God’s wrath/judgement, but I am aware that he has done so in the past. Nevertheless, people were hurt by what he tweeted and he has acknowledged that. At best, people were hut because he, as a professional communicator, was unclear. At worst, they were hurt because they understood he was telling them how they SHOULD be responding to a great tragedy (to turn and worship God), which is a very hurtful thing to someone who is already suffering- they don’t need MORE guilt if they cannot live up to what they SHOULD be doing. Or maybe they did assume he was explaining judgement and wrath because of what he has done and said in the past- it’s not a far stretch to assume that’s where he was going. The point is, his tweets hurt people and all of those defending him are piling on (when, in fact, Piper himself has at least backed off). The Christian community needs to learn to stop telling people they shouldn’t be hurt by something. “I was wrong and I’m sorry I hurt you” goes a lot farther than “You misunderstood me- what I said was good and you shouldn’t have been hurt by it”. Piper’s position was cast in a false light to begin with. There are many who seek to discredit him for various reasons, and the interpretation linked above is so far removed from the tone of his whole ministry as to be bone-crushingly hurtful. I have read and studied Piper’s teachings on suffering pretty extensively, which is why (at the time of the tweets) I was so taken aback by his posting those verses in such a limited context and platform. I love and appreciate the ministry of Dr. Piper, which is why I specifically chose to respond to this particular situation. For a man who has spent his ministry teaching with depth and compassion about suffering, depression and tragedy, posting those verses on a global platform on which many readers have no idea of the perspective from which he was posting, his actions were startling and abrasive, appearing insensitive. If I, knowing his perspective on Job and suffering, was startled by it, I can only imagine how someone with no knowledge of his ministry interpreted those verses. I was very appreciative of his removing the verses and issuing a statement of further clarification, but I am afraid that it was too late for many. Seems to be an ongoing issue for pastors with both a local congregation and a very public speaking and writing ministry; very often statements that would be perfectly understood within the context of their local body are completely misunderstood when they are dropped on the world in social media. It appears very much like inviting the world into a private family conversation in the middle of the discussion.